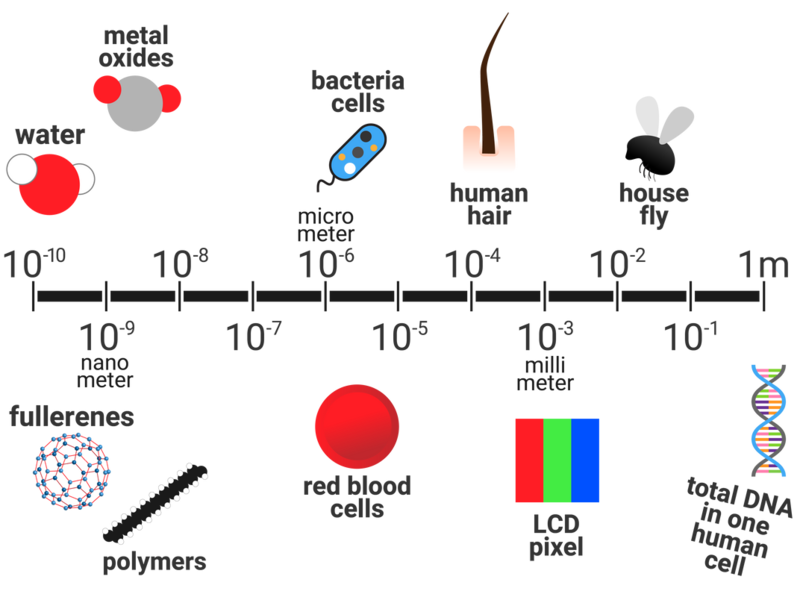 Nanoscience refers to structures that are 1–100 nm in size, of the order of a few hundred atoms. Nanoparticles, are smaller than fine particles (PM2.5), which have diameters between 100 and 2500 nm (1 x 10-7 m and 2.5 x 10-6 m). Coarse particles (PM10) have diameters between 1 x 10-5 m and 2.5 x 10-6 m. Coarse particles are often referred to as dust. As the side of a cube decreases by a factor of 10 the surface area to volume ratio increases by a factor of 10. Nanoparticles may have properties different from those for the same materials in bulk because of their high surface area to volume ratio. It may also mean that smaller quantities are needed to be effective than for materials with normal particle sizes. Nanoparticles have many applications in medicine, in electronics, in cosmetics and sun creams, as deodorants, and as catalysts. New applications for nanoparticulate materials are an important area of research.